While it may have seemed like the entire tech world had bought into the idea of physical retail stores becoming a relic of the past, all thanks to online shopping. It was only a matter of time, though, before some entrepreneurs started seeing the opportunity still inherent in brick and mortar stores. After all, over 90 percent of transactions taking place within stores. There's a ton of money to be made in that space, even if they have taken quite a beating in the last few years. That has led to a number of startups that have popped up, using technology to assist physical stores with improving their sales, traffic flow, as well reeling in new customers and improving the experience for existing customers. One of the newer companies in this space is consumer analytics platformAreaMetrics, which uses Bluetooth beacons to help shopping malls, retail stores, and restaurants gain insight into customer demographics and shopping patterns. The company announced a $2 million seed round of financing on Monday, led by early stage venture capital firms Startup Capital Ventures and Quest Venture Partners. Other early stage investors, including Seraph Group, Social Starts, and previous angel investors, also joined the round. AreaMetrics had previously raised $500,000 in angel funding, bringing the company's total raised to $2.5 million. The Seattle-based AreaMetrics recognizes customer behavior by using Bluetooth beacons, which are "little devices that are about the size of an egg," Brandon Bennett, Co-Founder and CEO of AreaMetrics, explained to me. Those devices emit a Bluetooth frequency of about 200 feet in every direction, which allows them to communicate with mobile devices. They can collect data such as whether or not the device was previously in the store, how frequently customers come into the store, which doors are most frequently used, and how many devices go by the store without coming inside. It can only sense devices that allow location and have Bluetooth turned on, and all the data is anonymous. "Big box retailers, shopping centers or the Walmart's of the world, they are really trying to understand more about their core consumer," Brandon said. "With online shopping growing rapidly, with things like Amazon and Jet, these big box retailers are trying to figure out how they can keep their core customer coming in, and to understand how those core customers interact with their businesses." "Online consumer websites have an advantage because they are able to tap into analyics products, such as Google Analytics, or other products, to really let them understand how traffic flow is happening on their website. What we're doing is giving the same situation for real world businesses, where they're able to understand the trafficflowin their business," said Carey Bennett, the company's Co-Founder and COO. The company was founded in 2014 by Brandon and Carey, who are husband and wife, along with Alan Solidum, who is AreaMetrics' CTO. It started out as a happy hour app, called Happy Hour Pal, which offered full happy hour menus, prices and descriptions. "We were living in Hawaii, saving money to get married. Hawaii was a pretty expensive place to live, and we found that going to happy hour was really the only way that we could afford to go out, and spend time together, out and about in the city," Brandon told me. "We realized there no good resources to find out what had food, not only drinks, so we ended up creating a happy hour resource to help people who had that same problem." They soon realized, through feedback from existing customers, that there was a much bigger opportunity that they could take advantage of: in-store analytics. "We got funding through the Happy Hour app and grew, but we were working with the restaurants and bars throughout different cities, and they were looking to understand their foot traffic analytics more," said Carey. "So when we started working with the restaurants on Happy Hour, we started playing with these Bluetooth devices, these beacons, and they became very interested in it. So the restaurants started asking, 'If I put a beacon in, what can I learn to make the experience better for my customers?' We started working with mom and pop shops, and it grew into larger brands, based on the knowledge we got from our early beta customers." AreaMetrics now has over one hundred of customers, and works with small restaurants across the country, big box retailers internationally, and malls in the both the U.S. and internationally. A mall, for example, can use the data that is collected to improve leasing opportunities by showing how much foot traffic a specific store will see, or a big store with multiple floors can see customers are staying on the ground floor or immediately going up to the upper floors. "It really helps them understand product placement," said Carey. Of course, there are a number of companies out there that are attempting to do something similar to AreaMetrics, such as Ptengine, which a heatmap platform that collects and analyzes visitors’ website behavior across all devices, in real time. There's also Swirl, which uses micro-location technology to increase store traffic, shopper engagement and sales conversion. 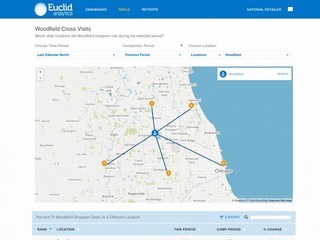 Probably the most notable, and well funded, startup in this space is Euclid, which offers stores a platform that helps customers see how people interact with physical places, and how they relate to one another. What separates AreaMetrics from these competitors is the speed and ease of use of the Bluetooth beacons, Carey and Brandon told me. "I think that, compared to a lot of other companies, like Euclid, we're more of a plug and play. We can get up and running faster," Carey said. "One of the key advantages is, by leveraging Bluetooth beacons in the way that we do, there's no big infrastructure investment on behalf of the brick and mortar establishment, or the shopping center. Where, in certain cases, they have to have either WiFi set up, or video cameras that detect patterns, we are literally, in a few hours, plug and play," said Brandon. The company can have as many as 30 beacons installed within just three hours. They are peel and stick, have a two-year battery life, and can immediately start transmitting data, which is then housed within AreaMetrics. The company has an API that allows store to pull down the data, so they can understand what's happening in their stores. The new capital that AreaMetrics has now raised will be used add key members to its executive team. It currently has four full-time worked, and two contract workers, and it is looking to have 10 full-time employees by the end of the year. It will be adding to the business development team, and a partnership director. It will also be used to expand its reach, and to bring in some national retailers in the United States. "One of our pilots can give us the opportunity to be in multiple locations. So I think our goal is really showing what we can do wth multiple pilots at the same time, and then expanding from there. Which is what we're doing. Starting with pilots is a great way to test the waters and the relationship, and it's going really well, so we're happy" Carey said. AreaMetrics currently has two pilots going with large national retailers. This is just the beginning for AreaMetrics. In the next few years, Brandon told me that he would like to see the company "helping big box retailers improve of the world improve the in store shopping experience, so that it can compete with the online space, where the experience is customized and personalized, and provide additional value to the consumer." "Our big goal, and big vision, here is to personalize your experience within the real world. Personalizing the experience could be anything from making a company more efficient behind closed doors of productivity, in the back of the shop, to make the experience at the front of the shop better for the consumer, to going into a museum and literally having a customized experience based on your preference and your likes and tastes," said Carey. "Just being able to walk through the world and having it be personalized to your liking, and making it more efficient for everybody." Founded in 2005, Seraph Group is a super angel fund that invests between $50,000 and $1,000,000 in high-growth start-ups, bridging the funding ‘gap’ left by individual angels and institutional VCs. Our growing network of 200 members offers an unparalleled breadth of expertise and a unified passion for helping founders build great companies. As dedicated early-stage investors, we understand how a compelling product becomes a powerful business and commit strategic guidance from the Seraph members best suited to help our companies grow. We also understand the value of time: Seraph Group manages funds and operates with a single Managing Partner that makes quick investment decisions, eliminating the challenge of syndicating angel investors. Social Starts is a $20M+ venture fund family. We support entrepreneurs whose companies serve the Social Construct, that change in human behavior generated by social/mobile technology. We invest at the moment of inception and Series A in 5 primary areas: media, marketing analytics, social platforms, mobile commerce and Internet of Things software. Our team has developed dominant media, research and tech companies in the 3 modern tech revolutions – PC, Internet and Social. Our portfolio companies benefit from the resulting rich perspective and world-class connections, a mutually supportive community of more than 130 fellow start-ups, and support from our LPs, who include leading figures in software development, marketing and media from 3 continents.